I haven't seen this posted yet. It's good to see more development on the east side, especially with the Pivot Group involved. What that article doesn't say is the developers are seeking $2.5 million in TIF, which represents about 25% of that total project cost. If you look at our summary on TIF Districts, you'll see the largest previous award as a percentage was 10% to the 21c Hotel. Also, it is my understanding they are asking the city to take out a loan for that amount so they can get the funds up front and apply directly towards their principal. This would all have to be passed through City Council when that time comes. If that is true, how can Steve Lackmeyer not mention that critical piece of information in a relatively long story. 25%??? He would have to know that an unprecedented percentage of TIF financing was being requested IMO and chose not to include it in the story. 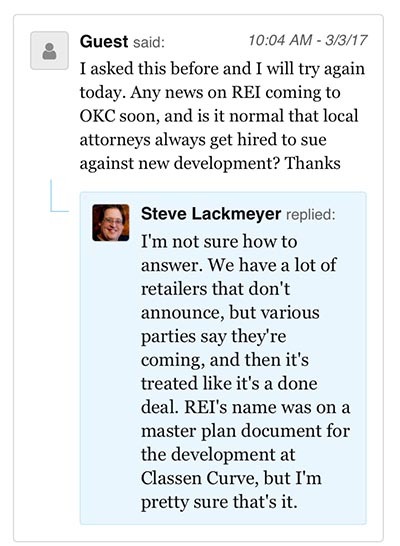 Can someone explain the difference between what the Oklahoman is doing with these development stories and what a PR firm would do for the developers? While that is a substantial request, this seems like a good use of TIF money for the city. However, the fact Steve failed to mention it in his article is an issue. In fairness, the reporter probably didn't know or bother to ask. Was it buried in their application? There is no formal application filed for TIF, so I can't report something that doesn't exist yet. N/M. My apologies, Steve. Just trying to make sense of this. P.S. Very glad to see you post. Cathy O'Connor has met with each member of city council to float the terms that I outlined. Every one of those links was on the Clayco deal, which was a very unique situation. Pete, I quit slamming you a long time ago. Let's stop it now. You've done a great job on keeping up with SoSA, tracking projects and keeping people informed. There are times when the tif application never got reported and never event happened because it never got beyond the exploration, which you say is happening now. Memory Lane Apts is one example. I'll do my work and not comment on what you do or don't get, my suggestion is you do the same. We're all trying to keep people informed on what's going on. I have no interest in fighting. But this was a very unfair jab. My understanding is the tif is related to something different they may do coming up, which I hint at in the story. I have no one telling me what you're saying. You are probably right. I don't know who your source is. You feel like you deserve credit for when you stop slamming me? Okay. All I did is add some important hard information that was omitted on this project. Then, you come to my site and post 1) that there is nothing to report (false) and 2) it's only worth reporting when there is a formal application filed (also false, as I pointed out with a quick link to some of your own articles). UH OH! I see a different type of march madness coming the way this conversation is headed. This was from just two weeks ago and you've done similar things like this for years. I have dozens more that I've saved, many of which are much worse. And please don't claim innocence here because this is direct reference to something I reported. You want to make amends? Stop trying to discredit me and this site. Pretty simple and actions speak louder than words. This was from just two weeks ago and you've done similar things like this for years. And please don't claim innocence here because this is direct reference to something I reported. Pete, when I answered this, quite honestly, I wasn't thinking with intent to discredit you. I just don't know how to answer some of these questions. What we need is to sit down, better understand our differences, and come up with some better ways to deal with these things. In the future, I will simply skip the question on this sort of thing all together. For what it's worth, I get a lot of people trying to troll me, trying to get me to go off on you and this site. I am pretty damn determined to to put this animosity to an end. Seriously. How about you stop copying my work without providing proper credit? I post and tweet article about Homeland renovation on 2/13/17 at 3:13PM, with full interviews and detailed information. You throw together a quick blog post and tweet at 2/13/17 at 8:16PM after pulling the building permit (easy for you to do because I had already had it prepared, as you knew from my article. If you had made an original request, it would taken several days, as it did me in this case). That building permit had been posted on 2/8/17 but suddenly you throw up a quick thing 5 days later within hours of my story while at the same time the Oklahoman is calling Homeland for an interview (I know because they called me by mistake the next day thinking it was you and/or Jack Money). Then a couple of days later, full story from Jack Money that says nothing new. Very, very easy to write an article once someone else has done all the work. Which is why when you or anyone else has a story first, we merely post it with full credit. This is all one-way and there is nothing to resolve until you stop your tactics. I post and tweet article about Homeland renovation on 2/13/17 at 3:13PM. That building permit has been posted on 2/8/17 but suddenly you throw up a quick thing 5 days later while at the same time the Oklahoman is calling Homeland for an interview (I know because they called me by mistake the next day thinking it was you and/or Jack Money)? At one time we used to be friends. Have a good evening Pete. I have heard you on the live chat bit and I'll strive to do better. On this last one, we may be at constant odds. But you know it's not just me. Sorry, but the ethics chair for Society for Professional Journalists -- of which I am a member -- has quite a different opinion. As does a journalism ethics expert I interviewed and journalists from highly respected outlets like Reuters and Bloomberg. If the standards are low in this town it's because of practices journalists like you employ. And saying "everybody else does it" is the weakest excuse at all, especially from the largest media company in the area. I'm sure you would be fine if I just drafted off your work? Take your stories that sit behind paywalls and just recreate them and put them out for free without giving you or the Oklahoman credit? I have never, ever done anything like that and I didn't need experts on journalism ethics to tell me not to. It's obviously highly unethical especially from someone sitting in a bully pulpit provided by their powerful employer. Pete, i think you'll find that the readers here have your back as opposed to Steve's. But there's a fundamental difference in the way both of you report. Steve reports for a corporate entity. So his job is to provide information that makes a person want to purchase a paper/membership. That means there's some enticing going on that clouds the strict journalistic world. And Steve, you can't say you don't do that because most articles of yours that I've read include those generalized non-specific "something big by someone you know, coming soon...". What that tells me is that you were forced to put out an article before all the facts were in because it needed to go to print....or you didn't finish your homework. The secrecy behind development doesn't force this type of reporting, it's a choice. Those development "secrets" only go so far and reporting on hearsay with no basis is dangerous. One of the great battles between online/print is that online has the ability to update on the fly. So Pete may not have any more details, but his forum (pun intended) for publishing allows him to post here and provide updates regularly at no cost. Being released from the confines of having to get a payment out of the reader makes it far easier to post what you see as the facts without having to put an editor's twist on them. This is also crowd-sourced in that all of the readers here tend to be similar development nuts and we often do our own homework to snoop out details to help get out the word on what's going on. Think about how many topics are on this forum compared to how many articles are posted in the Jokelahoman. OKCTalk far exceeds the paper's abilities and information. Enough that other media outlets use OKCTalk as a source at times. I've seen other reputable websites reports stories broken here, as well as TV in the OKC area. Due to the nature of the speed of online, by the time it gets to the paper, it's old news too. One big difference....OKCTalk doesn't pay either. So it's not as though Steve can make a living here doing what we all do as fun. If he wants a paycheck, he's going to be confined to doing that work at the paper. That's the only place that will/could employ him for that. But he's a lone duck there too. Sure, there are other articles posted by other journalists sometimes (actually i generally prefer their articles myself), but the majority are Steve's in the paper. This is all personal opinion, so take it for what its worth. I enjoy Steve as a historical writer (aka his book work), i'm just not a fan of his current development writing. But that development writing is what helps him to be able to write effectively as a historical writer. Not to mention the networking he is able to do. So while he's not my kind of guy, i think he definitely serves his purpose.....and does it well. So i would hope that Steve and Pete can find a way to collaborate and not work against each other. Step one of that HAS to be that if you use each other as a source, that it's cited. Otherwise, it's plagiarism. You'll find that when anyone posts something here, it's cited with the author/source (like our english teachers taught us to do ). That same thing needs to happen in the paper. Not saying it comes from OKCTalk, but that issue has become a LARGE one in all of journalism, not just Steve, so lets not point fingers too much. That's a whole other discussion. The TIF #9 committee will formally consider a $1.3 million TIF request for this project for Phase I; total cost is estimated at $4.3 million. That is just over 30% of this project where no TIF award has exceeded 10% in the past and the average is 7 to 8%. Even though not part of this Phase I request, it is estimated they will need another $2.1 in TIF for the $6.3 million 2nd phase. The developers are asking for the money upfront even though virtually no money has yet to be collected for this TIF. Good lord! This is ridiculous. If you have to get public subsidies for 30% of your project to make it happen, maybe it just shouldnt be done at all. And to get it up front? So the estimated cost for this project is $4.3 million for 18,000 square feet. That's $238/sq-ft for a building with a rendering that makes it look like a generic strip mall. Maybe this is a silly question, but is that estimate with or without the medical equipment for the clinic? I assume this includes build-out for the clinic since they would be a tenant in the project. I'm generally strongly opposed to TIF but given how hard it is to get things built on the NE side, does it make sense in this case? Genuinely asking. whats your fave city in Oklahoma & why? Oklahoma City chosen to host Oklahoma Senior Olympics '07 & '08 !